This system is controlled by the ecm, and is activated by the throttle position sensor and motor. The ecm controls the following functions: on-off, set / coast, resume / accel, cancel, vehicle speed operation, motor output control, and overdrive control. The ecm compares the driving vehicle speed from the combination meter with the stored vehicle speed set through the cruise control switch. The ecm controls the throttle valve motor of the throttle body to open the valve when the driving speed is less than the stored speed. 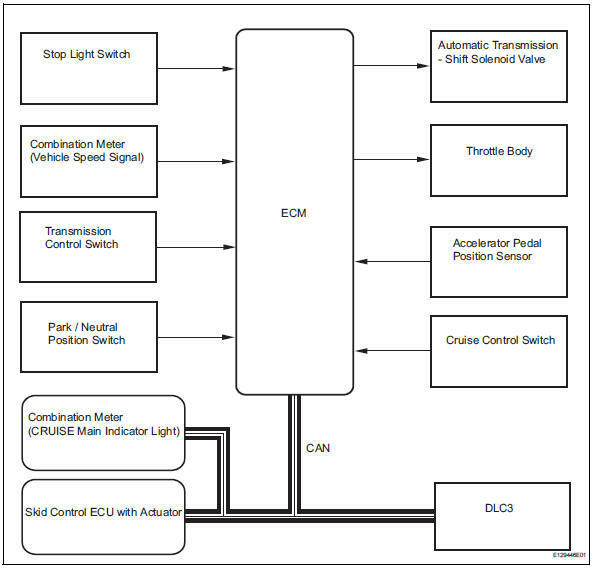 The ecm receives signals such as on-off, set / coast, resume / accel, and cancel from the cruise control switch. The ecm illuminates the combination meter cruise main indicator light when it receives the cruise control switch on signal. The ecm cancels the cruise control system when the brake pedal is depressed and the ecm receives the stop light switch signal. The ecm cancels the cruise control system when the shift lever is moved from d or 3 to a position other than d or 3, and the ecm receives the pnp switch signal. Low speed limit the lowest possible limit of the speed setting range is set at approximately 40 km/h (25 mph). The cruise control system cannot be set when the driving vehicle speed is below the low speed limit. Cruise control operation will be automatically canceled when the vehicle speed decreases below the low speed limit 40 km/h (25 mph) while the cruise control is in operation. High speed limit the highest possible limit of the speed setting range is set at approximately 200 km/h (125 mph). The cruise control system cannot be set when the driving vehicle speed is over the high speed limit. Also, +/res cannot be used to increase speed beyond the high speed limit. 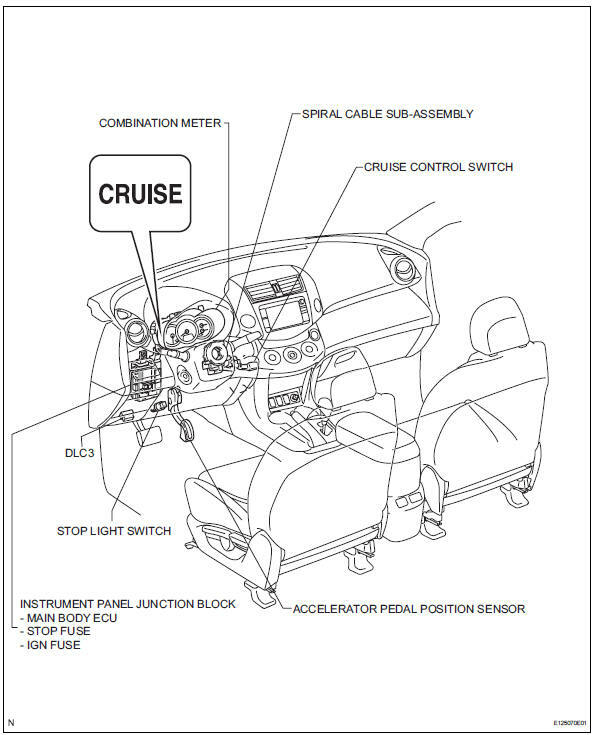 The cruise control switch operates 7 functions: set, coast, tap-down, resume, acceleration (accel), tap-up, and cancel. The set, tap-down and coast functions, and the resume, tap-up and accel functions are operated with the same switch. The cruise control switch is an automatic return type switch which turns on only when pressed in each arrow direction and turns off when released. vehicle speed is stored and constant speed control is maintained when pushing the switch to -/set while driving with the cruise control switch on (the cruise main indicator light is illuminated), and the vehicle speed is within the set speed range (between the low and high speed limits). The ecm changes the cruise control demanding throttle opening angle to 0Рand decelerates the vehicle when -/set on the cruise control switch is pressed and held while the cruise control system is operating. When the cruise control switch is released from -/set, the vehicle speed is stored and constant speed control is maintained. The throttle valve is not fully closed due to idle speed control, etc. W/ vsc: the brake is also used to decelerate the vehicle. When tapping down the cruise control switch to -/ set (for approximately 0.5 Seconds) while the cruise control system is in operation, the stored vehicle speed decreases each time by approximately 1.6 Km/h (1.0 Mph). When the cruise control switch is released from -/set and the difference between the driving and stored vehicle speed is less than 5 km/h (3 mph), the vehicle speed is stored and constant speed control is maintained. 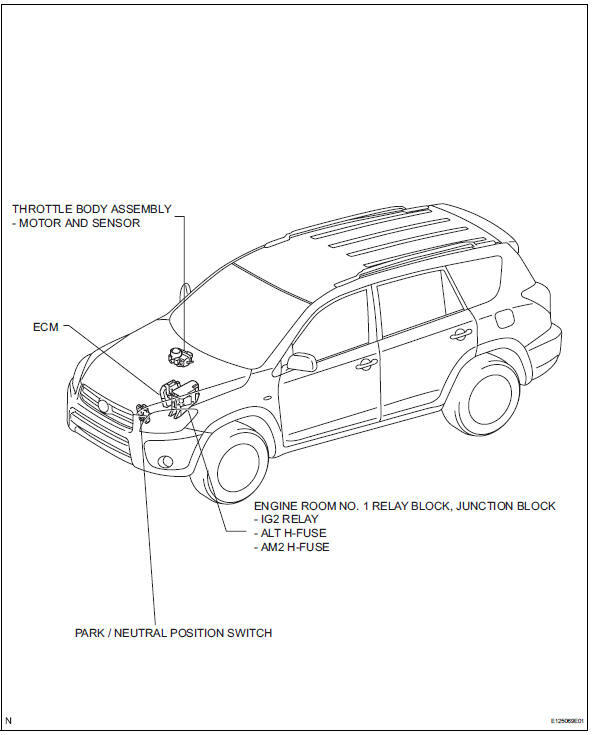 The throttle valve motor of the throttle position sensor and motor is instructed by the ecm to open the throttle valve when +/res on the cruise control switch is pressed and held while the cruise control system is operating. When the cruise control switch is released from +/res, the vehicle speed is stored and constant speed is maintained. When tapping up the cruise control switch to +/res (for approximately 0.5 Seconds) while the cruise control system is in operation, the stored vehicle speed increases each time by approximately 1.6 Km/h (1.0 Mph). However, when the difference between the driving and the stored vehicle speed is more than 5 km/h (approximately 3.1 Mph), the stored vehicle speed will not be changed. If the cruise control operation was canceled with the stop light switch or the cancel switch, and if driving speed is within the set speed range, setting the cruise control switch to +/res restores the vehicle speed memorized at the time of cancellation, and constant speed is maintained. Performing any of the following cancels the cruise control system (the stored vehicle speed in the ecm is maintained). This system has an automatic cancellation function (failsafe) (see page cc-17).